John Burgos started strong in this August 1990 game for AA Arkansas. The Tulsa World even described the start as a gem. He gave up four hits without giving up a run. He then gave up two walks in the sixth and ended up with the 3-0 loss, The World wrote. Burgos pitched in that game in his fifth season as a pro. He went on from that start to pitch a decade more, including in Taiwan. Burgos made AAA, but he never made the majors. Burgos' career began in 1986, taken by the Rangers in the ninth round of the January draft out of Arizona Western College. At Arizona Western, Burgos gave up four hits and struck out nine in a February 1986 loss. He started with the Rangers in the rookie Gulf Coast League. He went 3-3 over 12 starts, with a 1.55 ERA. 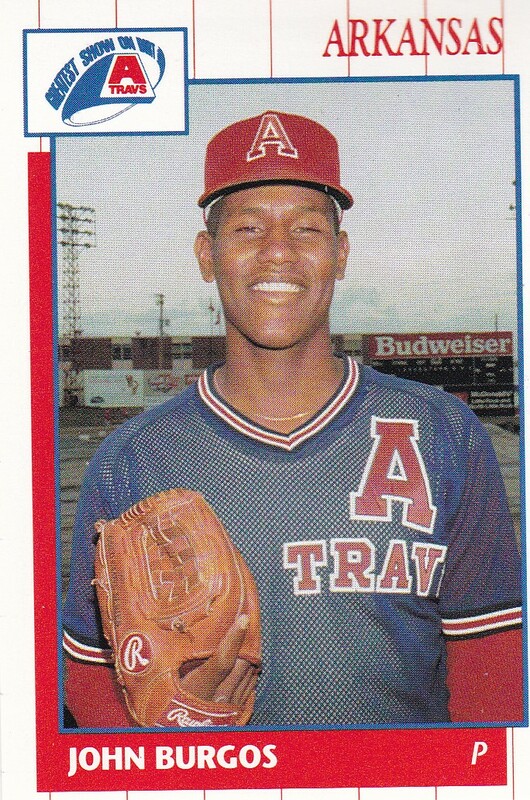 He made single-A Gastonia for 1987 and returned there in 1988. He then moved to the Cardinals system for 1989, playing an abbreviated five-start season between single-A Savannah and single-A St. Petersburg. For 1990, he made AA Arkansas and returned to St. Petersburg. He went 2-3 over six starts at Arkansas. He gave up a home run in an August Arkansas start. Burgos arrived with the Phillies for 1991 and got his first look at AAA. He saw 24 outings, six starts, at Scranton. He went 1-3, with a 2.95 ERA. Burgos continued playing in the minors and independent ball through 1998. He played in the Reds system from 1993 to 1995, never making it above AA. He moved to independent St. Paul for 1996, then returned to the minors and AAA Oklahoma City for 1997. He then played at independent Nashua for 1998. Burgos then moved to Taiwan and he stayed there for six seasons, from 1999 to 2004. His playing career over, Burgos turned coach. He worked in the Dominican Republic for the Rangers over three seasons. In 2009, he coached in the Arizona League.